Curtains and screens offer great flexibility in work zone layout in addition to special features that enhance safety and productivity. From noise reduction to temporary work zone creation, these durable screens and curtains are available in many standard colors. All curtains and screens are custom built - sizes shown are representative of commonly purchased sizes. If you don't find the size or color you need, please give us a call. Light from a welding arc can cause eye damage if not shielded. Prevent injury with weld screens. Mounted on aluminum frames, these screens block up to 85% (depending on color) of welding arc light and 100% of near UV and UV rays emitted during welding. 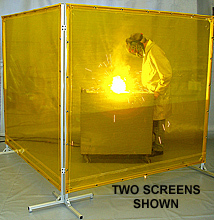 Flexible partitions contain sparks and fumes from welding and grinding operations while protecting others from flying debris and visible UV light. Available in many sizes and color options, these tinted vinyl partitions run on suspended track. Sometimes you need a temporary wall right in the middle of your operations. Whether to limit distractions or to provide a sense of spatial boundaries, privacy screens provide an instant wall that helps workers be more productive and attentive to the project at hand. Hearing loss from constant noise at higher than normal levels is an increasing problem. Machinery noise, vehicles, noisy appliances - they all contribute. Cut some of that noise down with sound control screens to drastically reduce noise levels.